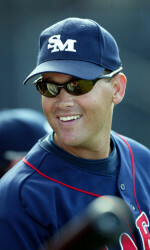 Moraga, CA – The Saint Mary’s College baseball team and head coach Jedd Soto have announced the schedule for the 2010 season. Highlighting the season are a total of nine games against teams that made the NCAA Tournament last year, three series against conference champions, one series against a 2009 College World Series participant, and a total of 33 games against teams who finished .500 or better. Fans will get their first chance to see the 2010 club February 19 when the Gaels take on the defending Western Athletic Conference regular season champion San Jose State Spartans, who finished with 41 wins last season. Opening weekend will continue February 20 on the road at San Jose State, and will finish with the Gaels hosting the Spartans again at Louis Guisto Field on February 21. After hosting the Nevada Wolfpack in a mid-week contest on February 23, the Gaels will be on the road for eight of the next game games. They will travel down south for a tournament hosted by Cal State Bakersfield, February 26-28. In the tournament, SMC will play CS Bakersfield, Bay Area competitor and Pac-10 member California, and Central Michigan of the Mid-American Conference. From there, the Gaels return home for a mid-week contest March 2 against Sacramento State, and return the favor by traveling to Sacramento, CA the following day, and then will make the trip down to Irvine March 5-7 to take on the Anteaters of UC Irvine. UC Irvine won the Big West Conference last season with a record of 45-14, was ranked no. 1 nationally for a period of time, and hosted an NCAA Regional. The Gaels hit the road again March 19-21 when they travel to New Orleans, LA, and take on Conference USA member Tulane. Following another mid-week road affair with the Hornets of Sacramento State on March 23, the Gaels return to the friendly confines of Louis Guisto Field March 26-28 for a series against UC Riverside, from the Big West Conference, which finished the 2009 season with a record of 33-20. Another eight-game road-trip begins on March 30 when the Gaels travel to UC Davis for a midweek game against the Aggies. The Gaels then head to Hattiesburg, MS for an April 1-3 series against Southern Mississippi. The Conference USA runner-ups with a 40-26 record, the Golden Eagles were one of eight participants in last year’s College World Series and finished the season with a no. 8 ranking nationally. It doesn’t get any easier for the Gaels from there when they return to California, as they travel to Palo Alto for a midweek contest against Stanford, perennial powers in the Pac-10, on April 7. The road trip concludes when the Gaels open West Coast Conference play at the Portland from April 9-11. Following the series at Portland, the Gaels will be local for the next seven contests when they return home and continue WCC play April 16-18 against Bay Area rivals, the San Francisco Dons. After a mid-week game against Sacramento State, the fourth meeting of the season, SMC will hit the road for WCC play and take on Santa Clara, April 23-25. Following an April 30-May 2 WCC road series at Loyola Marymount, the Gaels will return to “The Guisto” for its longest home stand of the year. They will host WCC power Pepperdine May 7-9, UC Davis in a midweek contest May 11, and defending WCC champions Gonzaga May 14-16. The Bulldogs finished last season with a record of 36-18 and a no. 22 national ranking. The Gaels will be on the road the last two weekends of the season, traveling to the Seattle University May 21-23 for a four-game series. Seattle is beginning its first season of baseball since the 1980 season. WCC play concludes with a series against the Toreros of San Diego May 28-30. There will be no West Coast Conference tournament or playoff for the 2010 season. The regular season champion will receive an automatic bid to the NCAA Tournament.